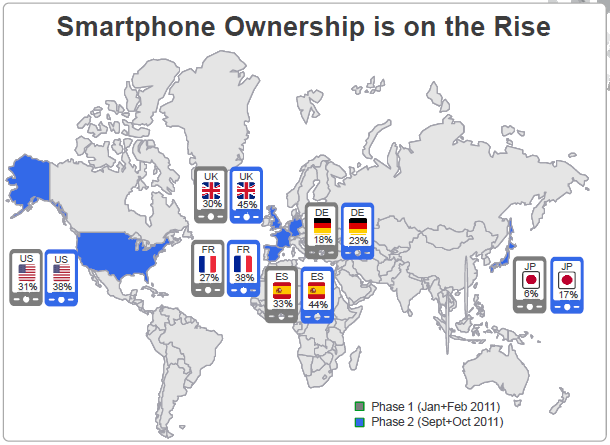 Let’s begin with a study from Google and Ipsos OTX MediaCT titled “Our Mobile Planet: Global Smartphone Users” (Feb 2012). Six thousand individuals across the US, UK, France, Germany, Spain and Japan were polled in the course of 2011. The first result that struck us was the speed at which smartphone penetration is increasing: from January 2011 to October 2011 smartphone penetration in western countries has increased by 20% (e.g. the U.S.) to 50% (the UK). As expected, almost 100% of smartphone users use their device to go online every day. It also comes as no surprise that smartphone users are avid video watchers and social networkers. 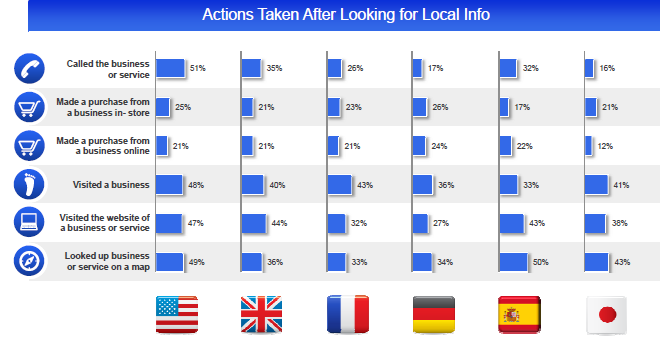 Interestingly, around 85% of smartphone owners seek local information and 1 in 5 make a purchase after finding that information. What does surprise us is that at least half of mobile shoppers make purchases monthly on their smartphones. So what about QR codes? 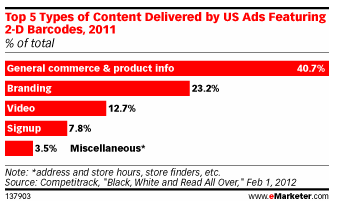 Our trend report gives some clues on their adoption, but comScore’s study “2012 Mobile Future in Focus” (Feb 2012) complements our research nicely. The report examines the mobile landscape across the United States, United Kingdom, France, Germany, Italy, Spain, Japan, and Canada. In total, 24 thousand respondents took part to the research. It appears that when in a retail environment, almost 20% of US smartphone users have scanned a product barcode. This is roughly the same number of people who take pictures of products or call/text a friend about them. Furthermore, 73% did so to find product information, 32% to uncover a coupon or offer and 25% did so to find event information. The above is in stark contrast with what the users actually receive when they scan a code. According to a third piece of research from eMarketer, “Mobile Barcodes Drive Traffic to Brand Sites from Print” (March 2012), 40.7% of the codes in US advertisements linked to product information, a brand’s site or a purchase opportunity. However, only 7.8% of the codes led to opt-ins for newsletters or contests, and fewer than 1% led to special offers, coupons, etc. Engaging consumers through their mobile device is about context (location, time) and action: “visit this shop next door”; “join the music event that starts in 30 min”; “scan this flyer and get an instant discount in this shop”; etc. All the ingredients to make it happen (mobile internet and devices, QR codes, consumer awareness of QR codes) are in place – marketers just need to grab the opportunity! 4 Responses for "Eye Opening QR Code Research"
Really great news and very timely in regards to seasonal businesses here in NE Ohio ramping up for 2012. Great lead in when speaking with biz owners. Nicely done folks! yesterday, and on the table were no less than 3 QR code on the table tent. I ask some of the customers if they know what the QR code was and most didn’t know how to scan the code. Still needs to be some more education out there. It’s very smart, it is. But I can’t buy. It’s like give a signed check with no numbers on, to pay for the amount of scans. I will not have control over the amount of scan, and therefore don’t know what my payment is. This is not in line with good business. Have variable that you not have control over, is not happen in my firm. Not a ethic way of making business from scanlife.